WHSmith has admitted it made more than £700 by selling single tubes of toothpaste for £7.99 in a hospital. 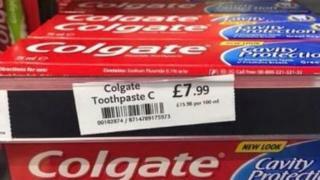 The Pinderfields Hospital branch in Wakefield was caught selling Colgate, normally priced at £2.49, by a visitor. The retailer apologised for what it called a pricing error, and said proceeds from the sales would be donated to charity St George's Crypt. In 2015, WHSmith was accused of exploiting hospital customers after it was found charging less in other shops. The retailer said 89 tubes of toothpaste had been sold in the Pinderfields shop while they were priced at £7.99. A spokeswoman said: "We would like to apologise to our customers for a recent pricing error in our system relating to this product." She added: "The error has been rectified and changed to the correct price of £2.49." Chloe Bond was admitted to Pindersfield Hospital in September last year after suffering stroke-like symptoms when stepping out of the shower. The 26-year-old was taken to hospital by ambulance at around 22:00 BST and remained there for three days while tests were carried out. She says she had no way of getting any toiletries, adding: "I was dying to wash my hair and I could've killed for a toothbrush. "The little store [WH Smiths] had the essentials but it was so overpriced - I probably would have had to spend about £40 just for personal hygiene. "When my dad came to visit me I was like, 'it's terrible' - I wanted toiletries, a toothbrush, some clean underwear and I was on my period. I was just so uncomfortable." Ms Bond describes toothbrushes being sold for around £5 or £6 and magazines and snacks being sold for multiple times the normal amount. In the end, the products had to be bought from a nearby Sainsbury's, where the total amount spent was about £10. This would have cost "three or four times as much" at the hospital shop, she says. "I got to feel human for a lot less money." Reacting to the story, BBC presenter and cancer blogger Rachael Bland described it as a "wider problem". She said she paid £5.99 for painkillers while receiving treatment at the Christie in Manchester. Neil Wilson said it highlighted problems with NHS outsourcing, as this created "captive markets ripe for price gouging". The BBC investigation in 2015 found that people were paying 89p more for a 750ml bottle of water and £1.50 more for an A4 refill pad at Pinderfields compared to a store of WHSmith in Leeds. After pressure from Dewsbury MP Paula Sheriff, the firm said it would match stationery prices and cut food and drink costs. St George's Crypt, which is based in Leeds, provides support to homeless, vulnerable and people suffering from addiction.